Toshiro Mifune, still relatively early in his career, stars as Musashi Miyamoto, the Japanese culture hero who virtually defines Bushido, the warrior code of the samurai. This is the first movie in a trilogy adapting Eiji Yoshikawa’s long (really long) novel fictionalizing Musashi’s early life, originally serialized from 1935 to 1939. Director Hiroshi Inagaki was such a big fan of the work this is actually the second trilogy he’d made from it: unfortunately the first three films, made in 1940 to 1942, are now lost. Though we Westerners most often associate Mifune with the classic films of the great director Akira Kurosawa, he actually made more movies with Inagaki, working with him from the mid-forties to the end of the sixties. This prestige film for the Toho studio was their first big-budget production together, and it was a hit even overseas, where it won the Best Foreign Film Oscar in 1955. It’s certainly gorgeous: Inagaki was a master of color, though unlike Kurosawa his compositions tend to be more pretty than striking. He was as adept with character scenes as with action, and his establishing shots of the Japanese countryside are beautiful. 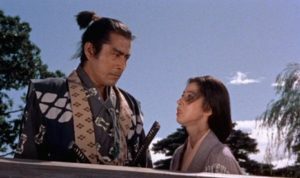 The film opens with Musashi in his late teens, a country samurai from the village of Miyamoto still named Takezo. He and his friend Matahachi (Rentaro Mikuni) naively leave the town to find fame and glory as warriors, joining the local army on the eve of the Battle of Sekigahara. Unfortunately, the side they join is the losing one, and they must flee to avoid the massacre of their army’s survivors. They fall in with petty criminals, a woman and her daughter who’ve been fencing stolen goods for a band of brigands. And suddenly we’re in a soap opera: Matahachi, who’d left behind a fiancée in the village named Otsu (Kaoru Yachigusa), makes a play for the daughter, Akemi, who rejects him because she’s favors Takezo. The brigands suddenly appear, demanding all the loot, and for the first time Takezo shows his talent for fighting by driving them away and killing their leader—all with a wooden sword! The mother, Oko, then makes a pass at Takezo, but he runs off, so she settles for Matahachi. All of this is to set up Takezo’s hopeless love affair with Otsu, which will be the romantic pulse of the rest of the trilogy. Takezo is intent on returning to Miyamoto to tell Otsu that Matahachi still lives, but on the way he’s detained at a checkpoint; he rashly cuts his way through the soldiers, and from that point on he’s a hunted outlaw. He goes from bad to worse, a feral fugitive in the woods lashing out at the hapless peasant troops sent to capture him, until Takuan (Kuroemon Onoe), the Buddhist priest of the Miyamoto temple, uses Otsu as bait and takes him into his custody. Sensing a powerful spirit beneath the savagery, Takuan sets out to tame the wild Takezo, hanging him bound for a tree for days to teach him humility, and eventually locking him in a castle attic for three years with nothing but a library of books. The historical Musashi, who fought his first duel at thirteen, avoided all romantic attachments, never served a samurai lord, and eventually wrote the classic Book of Five Rings, was a far more unusual man than the rather conventionally noble samurai represented in Inagaki’s trilogy. But Samurai I nonetheless does a fine job of setting up the spiritual journey (with swordplay interludes) to follow.